Mumbai, April 17: The Reserve Bank of India (RBI) on Tuesday issued new Rs 50 notes bearing the signature of its Governor Shaktikanta Das. Shaktikanta Das, a retired 1980 batch Indian Administrative Service (IAS) officer of Tamil Nadu cadre, assumed charge as RBI Governor in December 2018. 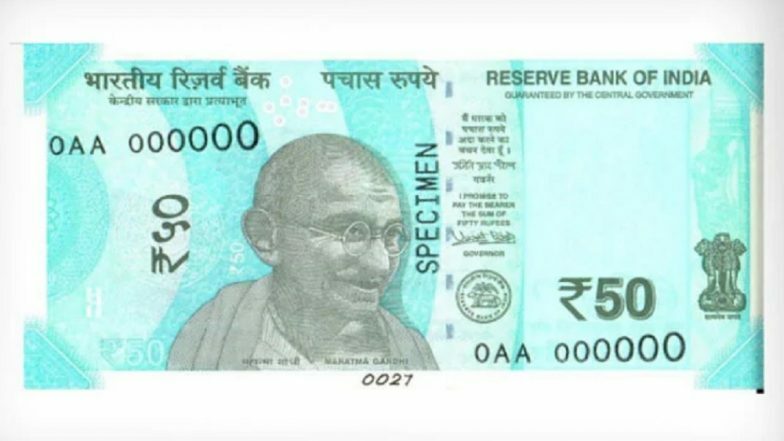 The new Rs 50 currency, in sea-green colour, is similar to earlier issued Rs 50 banknotes in all aspects, said the RBI. "The Reserve Bank of India will today issue ₹ 50 denomination Banknotes in Mahatma Gandhi (New) Series bearing the signature of Shri Shaktikanta Das, Governor. The design of these notes is similar in all respects to ₹ 50 banknotes in Mahatma Gandhi (New) Series," the central bank said on Tuesday. It also said all Rs 50 notes issued earlier by the RBI will remain to valid. RBI Exploring Mobile Phone-based Solution to Help Visually Impaired Identify Banknotes. "All banknotes in the denomination of Rs 50 issued by the Reserve Bank in the past will continue to be legal tender," the RBI said. The central bank had issued 'sea green-coloured' Rs 50 note, bearing signatures of former RBI governor Urjit R Patel, in August 2017. According to RBI's website, the dimension of Rs 50 note is 66 mm x 135 mm. New Rs 20 Note: With Additional Features, Reserve Bank of India to Soon Introduce the Currency Note.